This Windscribe VPN review mainly looks at the premium version of Windscribe although the company offers a Windscribe free VPN which gives limited coverage so it is not just a VPN free trial. For a regular user, the free VPN for windows might be enough to suffice yet if you are into streaming or torrents you might want to consider their premium option. Is there a big enough reason to choose between the free one and the premium? And do they offer enough to compete against the rest of the field? One of the main reasons anyone is looking for VPN providers and their services is to watch American Netflix. With both the desktop app and the browser extension all you have to do to get through to Netflix is select WINDFLIX, and you can get access to Netflix anywhere in the world. It is unfortunate this is still in beta stage so it might not work reliably. Torrents and P2P file sharing are allowed apart from Japan and India where it is not permitted. On the interface, it shows a P2P icon with a red dash through it is the country won’t accept torrents. Windscribe have a browser extension which deals with add-blocking and tracker blocking, and with they the company says you have a complete solution for your internet privacy while using an online VPN. If you drill down into the settings, you have an option to turn your PC into a VPN Wi-Fi hotspot and allow other devices to connect to the internet through you. The browser add-on also has a Secure. Link Generator. This is a link-shortening service that is geared to security. When you select a link, you are taken to a Windscribe Landing page that shows how many advertising trackers the visited page has. If you continue to the page using the extension, all these trackers are automatically blocked. This shortened link can also be password protected if you need protection when sharing this type of connection. When used in combination, the browser extension and the main pc app take you through a double-hop feature where you are connected through two VPNs which gives added anonymity. Another feature of the extension is the ability to remove the social buttons on sites you visit. Another option allows you to use proxy time which gives the impression the time on your PC is the same as the zone where the server you have connected to is. Two other browser VPN extension features are Split Personality where your user-agent profile becomes rotated which avoids tracking through any browser fingerprinting and finally cookie monster which will destroy all cookies that have been stored once your browsing session has finished. When asking is Windscribe safe? The resulting answer is it as good as any free VPNs if not better. Windscribe covers a host of devices and covers more than some other VPN options that are on the market. These include the regular Windows, Mac OS, iOS, Android as well as Linux and Amazon FireTV and Nvidia Shield as two of the not so conventional devices. Kodi also comes with a protection option and comes with a setup guide to do this. The Windscribe client also comes with an auto start option which can be handy for new users. This starts the services automatically when you turn on your machine boots up. This protects you from the moment your machine makes a connection. When you start with Windscribe, the process is simple enough, yet it is not the best for being beginner friendly as some options. Two steps are involved. First, you have the sign-up procedure followed by the download process. Although you are faced with a few choices, it is easy enough to see what you need to do without any significant stress. You are not even asked for a valid email address which adds even more anonymity to their service. Once you have supplied username and a password you can then download the client software. (The signup process does ask for an email, yet this is not required. Although if you have to reset your password, you won’t be able to do this). When signing up, users should know they are getting the full package apart from limited connections so the free version is not a trial VPN. In the most basic form, Windscribe has an easy to use interface. Once installed or each time you run the app you are shown the best location to connect to. This is generally the closest and the fastest server on offer. You can easily override this and connect to any other server of choice, and the next time you start Windscribe, it will default to this server rather than reverting back to the best location server. 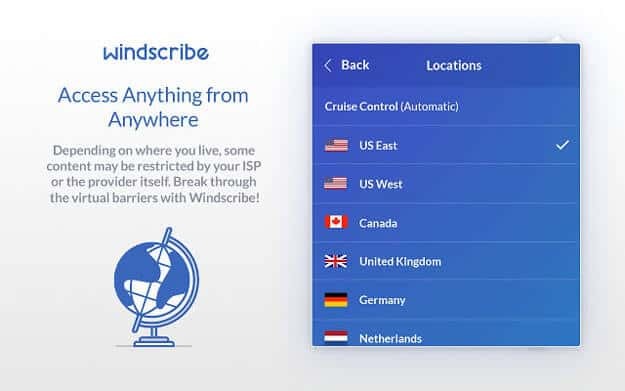 The premium plan lets you connect to any of the 300 plus servers Windscribe has located in 50 locations, so it is not the most extensive VPN network by any means. The free option drops this location number down to 11 which is still not bad for free considering you have a 10GB per month data cap. For any Australian VPN service this is more than adequate for regular surfing or to get a good feel for the service on the whole. For download speeds, you can find a mixed bag of results depending on your location. Although not the fastest out of any cheapest VPN offerings, in most cases they are high enough to cover most users. That being said this could be further hindered with the free option as you are limited to 11 locations. If you are for example in Australia, you might have to choose a server that is hampered by the distance. When it comes to encryption Windscribe is on par with many other VPN providers as they use an AES-256 cipher and SHA512 authentication. It also uses OpenVPN which is the fastest and safest open source standard Windscribe also uses a 4096 bit RSA key which bolsters up security. DNS leaks are also taken care of when you are connecting to one of their servers and should you lose a connection there is a kill switch which terminates your connection to prevent data loss or IP address leakage. Many Windscribe reviews say the same when it comes to the companies data retention, it says they don’t track or store any of your surfing habits, yet the total bandwidth you consume is logged for the month yet this is reset, so there is no long-term retention of this information. A part of this is to enable them to offer the 10GB cap for the free version, and it also helps them to identify any misuse or abuse of the unlimited data usage. One other thing that is recorded is the timestamp of when you last connected to their service. The company justifies this as they say it enables them to find inactive accounts. Windscribe does log your OpenVPN username, the VPN Server you connected to and the time of the connection along with the amount of data transferred. Windscribe say this is deleted within 3 minutes of your connection session ending. Windscribe is a decent VPN service and performance is acceptable although you might suffer if you use the free VPN access option. Overall their network is on the small side, but as far as being anonymous when online they give some of the highest amounts of privacy available. It has some welcome features such as the Secure.Link Generator yet some users might not welcome having to visit another landing page. The Windflix feature from the browser extension can make things more comfortable if you are traveling however this could end anytime due to Netflix and their continual struggle to limit their service from being accessed via a VPN. 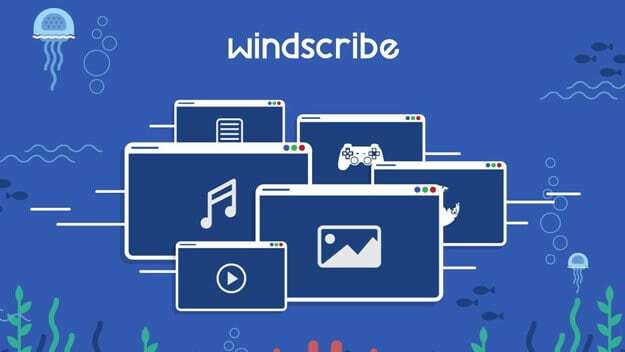 With the company being based in a 5 eyes country and the minimal logging that it says it contains, Windscribe might be a worthy option even if it is only for the free version. The Premium package is comparatively expensive compared to some alternatives yet sign up for an extended period, and the discount brings it more in line with other VPN providers. The service that Windscribe provides is decent, and they keep improving, although when you look at the competition, they might be developing yet still remaining in other VPN provider’s footsteps. Windscribe is highly rated as quality free vpn service but you get what you pay for? Maybe, and for a service that offers a 10GB cap on their free services and unlimited connections on their premium package, there is a lot to like about Windscribe, yet there are others that give users that little bit extra and with a much more significant coverage area.